The uber versatile MacBook Pro has been specially engineered to unleash your possibilities with its dynamism. Hence the accompanying backpack for storing and carrying the same needs to be equally brilliant for adding to its brilliance. Today we are going to take a look at five of the best 15-inch MacBook Pro backpacks which can serve as a commuter’s ally by offering portability, convenience and safety in every step. You need to purchase a model which can serve as the ideal pick for your Mac since incorrect sizing can reduce your laptop’s safety. However, you also need to pay heed to the belongings you wish to carry along and whether your backpack has enough space for that. If you are thinking of commuting long distances, then you need to be extra cautious about the weight of the backpack as it needs to usher in comfort to your spine and back. Special padded pockets can protect your MacBook from dents and scratches for keeping it safe. Your backpack needs to offer impact-reduction to buffer against accidents which might occur in the way. Featuring multiple compartments, the Incase Icon Pack can serve as your ultimate pick for daily use. However, the segmentation of pockets doesn’t leave the backpack with a single large pocket for fitting in your jacket like the traditional book bags. It is also narrower and deeper than its peers making it the ideal pick for being placed under the seat while traveling and still enjoying ample leg room. The interiors of the front compartments feature an array of Velcro pouches which help with storage of small items having a tendency of getting lost underneath heaps of other stuff. The fuzzy fleece lining of the main laptop slot helps in keeping your tablet screen clean as you hop around with your 15-inch MacBook Pro in style. Its side pockets located near your hip position are uniquely angled for allowing easy access even with the pack on your back. Its wide straps can be adjusted both from top and bottom for ushering in greater comfort. The padded back also imitates the feeling of having three different pads on your backpack which increases airflow. Even vulnerable regions such as the plastic adjustable strap and zipper seem sturdier than its peers making the Incase Icon pack one of the toughest backpacks available in the market. Clean and professional grade aesthetics. Stands upright even when empty. Comes with fur lined dedicated pockets meant for holding your laptop as well as smaller accessories. Fits easily under an airplane seat. Pockets do not encroach each other and can be accessed easily even with the bag full. Lacks dedicated pocket for holding a water bottle. Zipper track might actually scratch your expensive MacBook if you are not attentive. This tough traveller backpack featuring an added tablet pocket can easily fit most of the laptops available in the market. The OGIO Renegade has been designed to handle 17-inch notebooks which makes it all the more unwieldy. However, you are bound to get over this minor flaw once you start benefitting out of its standout features. This black bag having a standout red lining features a crush-proof compartment which can be used for easily storing your 15-inch MacBook Pro. The ergonomic shoulder strap of the Renegade RSS makes it extremely easy to carry around. The cushioned back panel will hardly let you feel the weight even when you walk around with a bevy of belongings in your backpack. 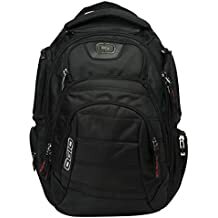 Even when you are in the mood for carrying along all your accessories, the OGIO backpack distributes the weight comfortably across several pockets to assuage the burden. Its upper and lower back padding coupled with the stiff back panel ushers in tremendous comfort while enabling airflow to keep your back dry at all times. The back zippered pocket of the renegade RSS makes it easy to grab your laptop and pop it onto an X-ray tray seamlessly. Pouches can fit in everything ranging from charger cables to extra camera battery and even headphones. Extra comfort is guaranteed by the foam padding in its shoulder strap. Comes with a plethora of pockets to keep all your belongings organised in a neat manner. Adjustable sternum straps make it ideal for people of various builds and heights. Innovative Reactive Suspension System (RSS) cradles your laptop to protect it from all chances of damage if you drop the same accidentally. Crush resistant tech vault having moulded armoured pocket can keep your valuables safe at all times. Has a tendency of rolling over onto its face when set down. With a plethora of pockets meant for catering to individual gadgets, the Gambit 17 can serve as your ideal choice to carry around all gadgets and accessories with absolute ease. Supreme support is rendered by its shoulder straps and adequately padded back panels so that you don’t feel strained even after carrying around the backpack for long stretches of time. Its fleeced large back pocket assists in carrying two laptops at once while rendering extra safety in between compartments courtesy its red foam panels. The widest second panel can serve as your ideal choice for storing both notebooks and textbooks apart from your technical gadgets. The tablet compartment features soft padding as well as a zippered pocket space to store additional accessories. Miniature pockets are present in the last compartment for holding accessories, pens and passports. The crush-proof tech vault pocket feature soft tricot liner for rendering adequate protection to lenses while the glasses are held in place by the Velcro. The dual mesh side pockets with elastic corners assist in securing water bottles while the additional padded side pockets are meant for holding your camera and mouse. The easily adjustable arm straps of the Gambit 17 make it tailor made for smaller individuals. The unique design of this backpack assists in unzipping its pocket all the way to the bottom for completely opening the pocket and getting your laptop out easily. Features sufficient padding to keep your laptop protected at all times. Has plenty of compartments and pockets to keep all your valuables organised in a nice manner. Comfortable shoulder strap and back panel which adds to its lucrativeness. All the pockets are secured by heavy-duty zippers which can keep your belongings protected from theft. Crafted with thick material which adds to its durability. Available in the single shade of black. If you are on the lookoutfor an uber stylish bag which can carry your tablet, laptop and other bare necessities without piling on much bulk, then the water-resistant backpack from LAPACKER can serve as your best bet. Whether you are a commuting professional or a mobile manager,the lightweight backpack can conceal all your belongings even while preserving an executive external appearance. This stylish bag has been specially crafted to suit you well at all times whether you are travelling, camping, hiking or simply going to school or workplace. You can also easily lift the backpack whenever needed coupled with its top handle. 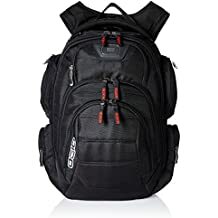 Breathable mesh pad lining its back makes the slim backpack feel easy on one’s skin while its comfortable padded shoulder straps aid with even distribution of weight so that you can relax your shoulders. The convenient headset grommet helps in accessing your MP3 player easily so that you can keep your entertainment meter filled at all times. Its backside pad imparts adequate protection to your MacBook while helping the backpack in maintaining its shape. Your laptop will remain buffered from all chances of damage with its preventive cushion. The double layer zipper can keep you buffered from falling prey to theft whereas the hidden back pocket can assist you in storing all your valuables to safety. You can now brave the rain without having to worry about your valuables courtesy the water-resistant fabric of the LAPACKER backpack. Crafted using anti-scratch and tear-resistant fabric which adds to its durability and makes the backpack extremely easy to clean. Extra padding is provided by the airflow backing system for rendering maximum back support. Ergonomic S-shaped shoulder straps which can make you feel comfortable even while carrying the heaviest of loads. Zipper pocket helps in keeping your valuables secured from theft. Mini side pockets can easily fit medicine, cords, snacks, candy bars and a lot more. It stays pretty slim even when loaded with items. Extra side pockets help in carrying mini towels and water bottles which can prove to be extremely helpful during the summer season. Bottom of the main compartment lacks adequate padding. 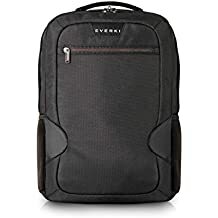 The slim and conservatively styled laptop backpack from Everki can serve as the ideal choice for people who carry their MacBook Pro to work along with other essentials on a daily basis. 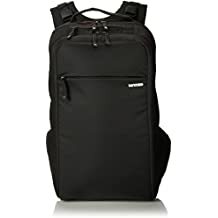 The lightweight backpack features integrated laptop corner guard system which can be of great help in buffering your device from all scratches and bumps. Ample padding and felt lining join hands with shock-absorbing pads which are embedded into its bottom for rendering adequate protection to your precious laptop. You can thus focus solely on the journey as Everki takes care of your 15-inch MacBook Pro. Another aspect which deserves special mention is its well-organized compartments which maximizes storage space without putting on much bulk. Its second zippered compartment comes fitted with a key ring buckle, large transparent pocket, slots for business cards and pens as well as ample space for storing cables, USB drives and adaptors. You can also store and retrieve your cell phone, tickets and even an earbud through the outer-zippered pocket. A trolley handle pass-through strap is hidden behind the lumbar pad to pass over the luggage handles in a smooth fashion while providing you with greater mobility while on a trip. However, its low-key presentation merges easily with the overall bag’s appearance. You can also adjust the dangling straps by pulling the discreet slider located at the end of each shoulder strap. An aesthetic flow is maintained by its easy to reach side water bottle pockets which can blend in seamlessly with the backpack’s exterior for accentuating its charm. The high contrast orange lining which blends beautifully with the bag’s overall look also makes it easier to identify items under varying lighting conditions. It’s all metal zippers also imparts greater durability when compared to its peers and even feature lock holes which can protect your valuables while commuting on a crowded transport. Constructed using premium grade materials. Can keep your necessities well organized during your trip. Durable enough to withstand everyday use. Features wide and ergonomic shoulder straps. Zippered stash pockets help in accessing smaller items such as cash, ID, tissue, gum etc. Bottle holders can only cater to the small sized ones. 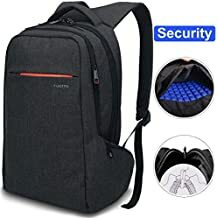 Although laptop backpacks offer a decent amount of protection, it does not tag along any extra versatility and can even prove cumbersome to carry around. This is where a good backpack comes in to provide better protection in terms of a secure fit and similar possibilities. Your MacBook stands vulnerable to damage if your backpack is too big as that might lead to a loose fit. Comfort also has a big role to play especially if you wish to walk around a lot with the same.